WHY A PRIVATE JUNK ? - Better service and food. Oriental Bridge Travel is the happy owner of its two-cabin private junk, Oriental Sun. The fact that we own her presents enormous advantages: The fact that we own her presents another enormous advantage compared with junks sublet from their owners by agencies: as sole owners, we are in complete control of the quality of the onboard services and of the maintenance (in addition to the regular checkings, Oriental Sun is taken to a shipyard and completely inspected once a year). We propose to you cruises from 2 to 4 days, as well as a sensational programme: A 2 to 3-day cruise on Oriental Sun, combined with a one or 2-day stay in the magic "Halong Bay on Land" of Ninh Binh (Tam Coc). An ancient 22-meter fishing junk, she has a very rare particularity: she has two real sails, which allows her cruising without engine, weather permitting, whereas most other junks have decorating sails. Even more environmentally friendly, she has a system of treatment of used waters before they are rejected in the sea. Oriental Sun has been entirely redecorated in May 2018. She counts two 15-m² cabins, one double and one twin, each with its own bathroom, an open lounge-dining room on the stern deck, and a bow sun deck large enough to sleep « under the stars » if you wish. Meals are feasts of sea food bought in the fishing villages we visit, a guarantee of its perfect freshness, and prepared by a true Cordon Bleu sailor. Our junk Oriental Sun has obtained in 2013 the certificate of respect of the environment issued by the Office of the Cat Ba Archipelago Biosphere Reserve. Important remark: Oriental Sun has 2 cabins, but, if you are only 2, we do not take other passengers on board and the junk is for you alone. Oriental Sun starts from the island of Cat Ba. To reach the island from Ha Noi, you have the choice between 2 solutions: private car or local bus. Car from your Ha Noi hotel to the local bus Ha Noi-Haiphong, then boat Haiphong-Cat Ba. Return by the same means. The driver and English-speaking guide meet you at your hotel around 6:30 for the transfer by car or bus from Hanoi to Haiphong and by boat from Haiphong to Cat Ba Island. Arrival in Cat Ba around 12:00, boarding on Oriental Sun. Seafood lunch while the junk starts sailing through Lan Ha Bay, a protected site part of Cat Ba National Park. 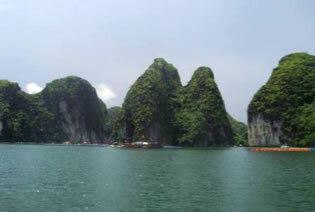 We then enter Halong Bay, peacefully sailing between isolated islands through channels inaccessible to larger boats. Return to Lan Ha Bay. We stop on a isolated small beach for swimming and/or kayaking weather permitting. Visit of the Hang Ca Lagoon, accessible by a small craft through a tunnel. Delicious seafood diner and night on board in Lan Ha Bay. 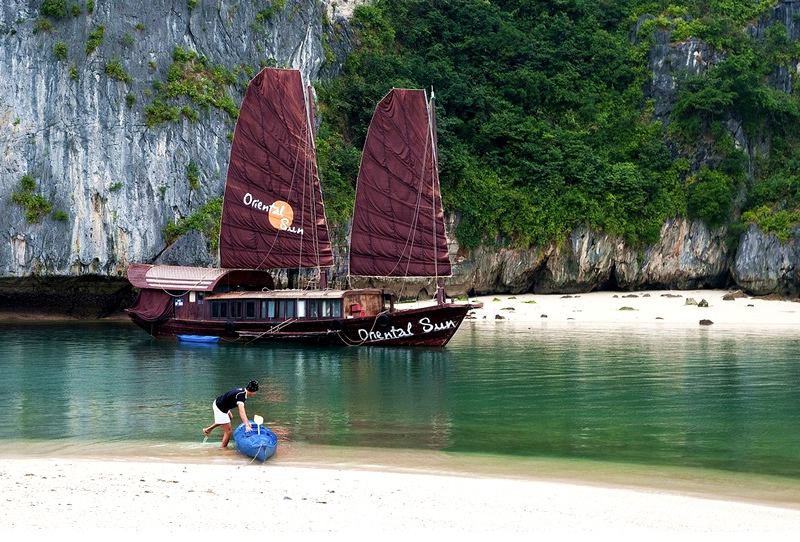 Because of a litigation between the Authorities of Cat Ba and Halong City, the junks based in Cat Ba cannot sail in Halong Bay and Bai Tu LongBay. 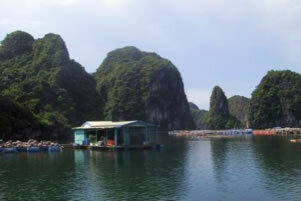 Continuation of the cruising in Lan Ha Bay, among the myriads of limestone peaks. Visit of a fish and shellfish farm and of a fishermen floating village of Cai Beo. Lunch on board (or on land if we have to embark new passengers), disembarkment between 11:30 and noon and return to Hanoi, where you arrive at your hotel around 18:00. We are the only junk operator proposing a one-day cruise in the superb Gian Luan Archipelago north of Cat Ba Island. Arrival in Cat Ba around 12:00, boarding on Oriental Sun. Seafood lunch while the junk starts sailing through Lan Ha Bay, a protected site part of Cat Ba National Park. Cruise in the bay, with visit of the the Hang Ca Lagoon by kayak through a tunnel. Seafood dinner and night on the junk in a small bay. Continuation of the cruising in Lan Ha Bay, going northwards to the superb Gia Luân Islang Archipelago. 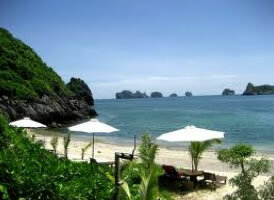 Return to Lan Ha Bay, to visit by free bicycle or at your charge electric cart (10$ supplement) the village of Viet Hai. Return on the junk for dinner and a second night. We can also organize for you a customize cruise with the itinerary and for the number of days you wish. Please do not hesitate to ask us. 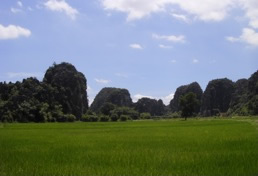 This tour takes you to a charming fishermen island, Ngoc Vung, located in Bai Tu Long Bay. It combines 2 nights and a very pleasant beach day in the island, and a cruise on our private junk Oriental Sun which sails through the bays of Bai Tu Long, Halong and Lan Ha all the way down to Cat Ba Island. Your driver picks you up at your hotel, direction Cam Pha Harbour. Local lunch, followed by the transfer on a public boat from Cam Pha to the island. Upon arrival at the island pier, a tuk tuk takes you to your beach hotel. Relaxation, diner and night on Ngoc Vung. Please note that the island counting one hotel and 2 nearby restaurants only, a guide is not necessary. Free day in Ngoc Vung. In the morning, you may want to go to a small isolated beach on the left of the hotel when you face the sea; the path to go there is accessible only in the morning until noon; bring shoes because of sharp pebbles on the path. Lunch and relax on the main beach or stroll in the island. Diner and 2nd night in Ngoc Vung. Around 8:00, transfer by tuk-tuk to the pier, where our private junk Oriental Sun and a guide wait for you. Cruise in Halong and Lan Ha Bay. Kayaking off the 3 Prunes Beach. Lunch and diner on board and night on the junk in Lan Ha Bay. Continuation of the cruise in Lan Ha Bay. Lunch and disembarkment around noon, followed by the 14:00 speed boat Cat Ba- Hai Phong and the return by private car to Hanoi, where you arrive around 18:00. Based in Hanoi, a small dynamic agency founded by 2 young Vietnamese. Their cruises in Lan Ha Bay and Halong Bay offer excellent services in a private or collective junk (2 and 3-day cruises). Several levels of comfort and rates, extreme seriousness in the organization, traditional products (seafood) on the cooking side, and an excellent knowledge of the bays… Our preferred boat: their ancient private junk, Oriental Sun, with real sails (she also has an engine!). Our private junk Oriental Sun has obtained in 2013 the certificate of respect of the environment issued by the Office of the Cat Ba Archipelago Biosphere Reserve. A chauffeur-driven car picks you up at the disembarkation quay of the boat Cat Ba-Haiphong. 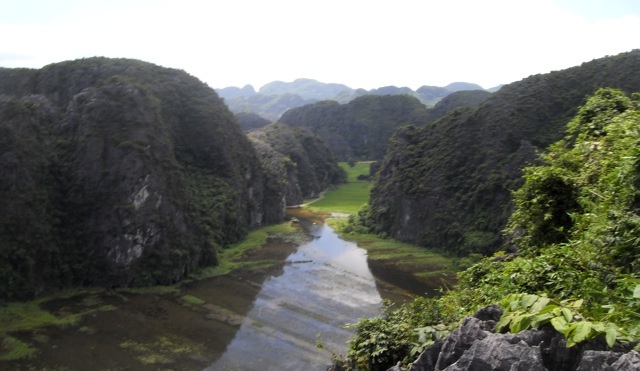 We then drive through the Red River Delta from north to south and arrive around 19:00 in Tam Coc, 6 km from the capital Ninh Binh in the middle of the magic Halong Bay on Land. Registration at the hotel Chez Loan, among the lime peaks and rice fields, rest, and a delicious diner (Vietnamese fondue). 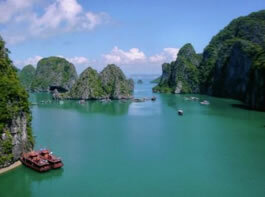 In the morning, we go boating on the 3-tunnel river through lime cliff canyons, one of the "Must Do" of Vietnam, followed by the visit –by car on bicycle at your choice- of the Bich Dong Pagoda, built on 3 stages on a cliff, and Thai Vi Temple. Lunch chez Loan. We then take a small road to an astonishing site, Hang Mua Pagoda, perched on a high mountain, and from which you enjoy a stunning panoramic view of the entire region…at a price: climbing 450 steps, totally worthwhile. We then drive on 15 superb kilometers of small roads through the lime peak maze, one of our little "secrets", and arrive in Hoa Lu, the first capital of Vietnam. Visit of the two temples of Hoa Lu: Dinh Thien Hoang and Le Dai Hanh, and drive back to your Hanoi hotel. In the morning, we go boating on the 3-tunnel river through lime cliff canyons, one of the "Must Do" of Vietnam, followed by the visit –by car on bicycle at your choice- of the Bich Dong Pagoda, built on 3 stages on a cliff, and Thai Vi Temple. Lunch chez Loan. We then drive on 15 superb kilometers of small roads through the lime peak maze, one of our little "secrets", and arrive in Hoa Lu, the first capital of Vietnam. Visit of the two temples of Hoa Lu: Dinh Thien Hoang and Le Dai Hanh. We then return to Chez Loan for a free à la carte diner and the night.